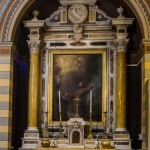 The main altar of St. Mary. A 100 meters from San Policarpo is the Catholic Church of St. Mary. Overshadowed by its famous neighbor, this church and monastery just beginning to be known tourist city. 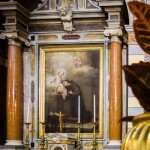 In fact, Santa Maria was built by the Franciscans 200 years before Suleiman the Magnificent gave his permission for the construction of St. Polycarp. 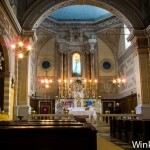 This is the story of the church was declared Cathedral in the nineteenth century by Pius VII. 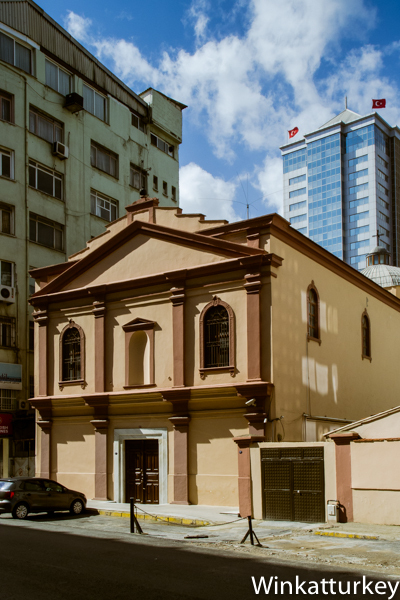 The original church was begun in 1341 but was destroyed by the earthquake in Izmir 1688. The neighborhood where the church is located was then known as Maltezika, for there lay Catholic community who came from Malta. In 1698 the church was reopened with support Dutch. However, Saint Mary always enjoyed the protection of Genoa and Venice, although the decline of these cities made the church and the monastery under the protection of Austria. For this reason, when a fire destroyed the church in 1889, Emperor Franz Jose financed its restoration. In those days, French engineer Gustave Eiffel directed the construction of Konak Pier, Customs port city. Current St. Mary cover by the famous author of the Eiffel Tower. The church of Santa Maria has a single nave with four side altars. One of the side altars of the church. The floor of the deck is a clear example of the style of Gustave Eiffel. Throughout its history, the church was under the care of the Italian Franciscans, so that 1919 officially became the property of Italy. The church was not affected by the terrible fire of 1922 and the Franciscans took in many of those affected by the disaster. Santa Maria is still active as a church today and is one of the places where the Catholic minority of Izmir goes for religious celebrations. View map of Izmir Area. And I imagined a small, humble chapel,do not know why. The truth is that it is very nice and quiet.